Four years ago, I wrote Read This First to help executives understand the role of social media in their businesses. And while much has changed over the past few years, more has stayed the same. Marketing success in the age of social networks requires a different approach to content creation. I’ve spent the past few years trying to distill “different approach” into a compact, yet powerful statement–an elevator speech if you will. I found it last month in one of the most unlikely places. The father and son team of Ed and Steve Sabol founded NFL Films in the early 1960s. Their work changed not only the way football games were recorded, but probably influenced the way all sporting events were memorialized. An NFL Film tells the story of the gridiron, where infinite forces clash with immovable objects, resulting in serious consequences for the game’s battle-hardened warriors. Rather than mounting a single camera at the 50-yard line to view the game as a spectator, they used cinematography techniques including multiple cameras and camera-angles to cover a game. But the magic of an NFL Film story occurred in post production, when they added the velvety baritone voice of John Facenda reading perfectly-written voice-over narratives. 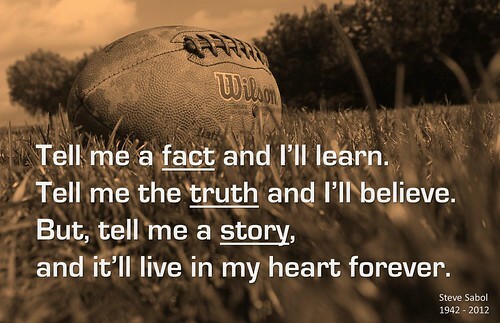 But, tell me a story, and it’ll live in my heart forever. The statement hit me with the force of blitzing linebacker, because most companies are great at telling facts and truths, yet fall short at telling stories. Therefore, the role of a content marketer is to transform company facts and truths into in stories. Give it a try. The next time someone asks what your role is, just give them a little Steve Sabol. 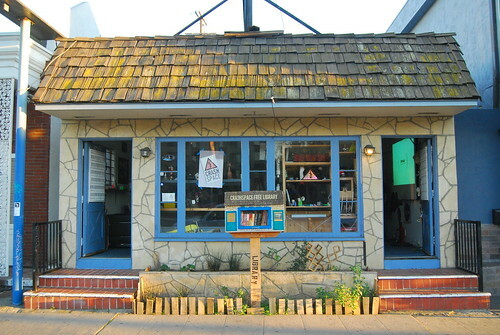 For the past year, I’ve wanted to visit a hackerspace–a physical location where inventors of all ages gather to share equipment, knowledge, and experience. I got my opportunity two Saturdays ago when I visited Crashspace in Los Angeles. I attended the eLeCTRONiC WeAraBLes Meetup as a member of Epson America to help product manager, Eric Mizufuka, demonstrate Epson’s Moverio BT-100 transparent display glasses to those who might want to incorporate the platform into their own projects. Crashspace-LA consists of a small storefront located on Venice Boulevard in Culver City, California. Its meeting room held about fifty people, who had self-organized themselves into three groups: those who sat on folding chairs, those who sat on an old couch, and those who stood along the walls. Latecomers peered into the room through two open doors that lead to the sidewalk. The attendees included parents, teachers, students, entrepreneurs, recent college grads and old, crusty engineers like myself. And although our interests varied wildly, the reason for our attendance remained the same–something that Annika O’Brien, founder of the LA Robotics group, explained perfectly. After quick introductions, attendees were encouraged to demonstrate projects. One-by-one,they showed their work. 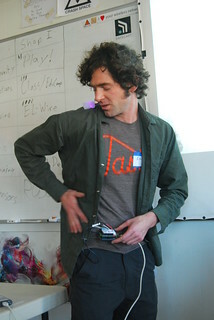 Rich demonstrated his “hug-o-meter,” a jacket lined with conductive sensors that sent signals to multi-colored LEDs. 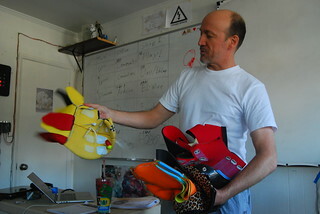 Others had stitched Arduino microcontrollers into swaths of fabric…and in one case, a hat. 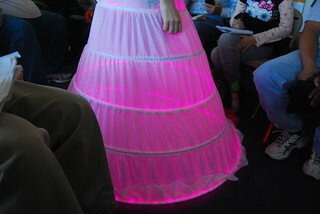 A representative from Illuminode raised the bar by demonstrating commercially-available, LED-laced garments, that were programmed to interact with each other, changing colors based upon variables such as proximity and the relationships. At this point in the meeting, my expectations had been met. I was among inventors demonstrating whimsical applications. But my experience changed when Frank took the floor to demonstrate his latest wearable technology project. Frank explained that he hadn’t slept much since he heard about the tragic death of Chief Petty Officer Terrell Horne III, who died of injuries inflicted when he was rammed by a suspected drug-running boat. Although Frank had never met the Chief Petty Officer, he felt the loss personally, leading to many long nights trying to find a way to avoid this type of death in the future. Dressed in sweatpants and a white T-shirt, Frank stood in front of the crowd revealing material after material that he was testing to build a new type of helmet. Frank’s interest in safety didn’t just begin in December. He was issued US Patent in September 2011 for a Damage Resistant Aircraft. I shouldn’t have been surprised at the intensity of Frank’s motivation. 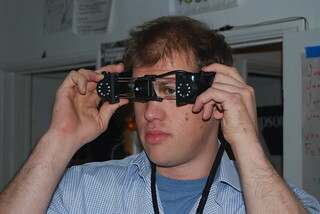 The night vision demo brought by Epson was also inspired by a tragic news story. Conceived while watching news footage of rescuers trying to find Hurricane Sandy victims, its inventor set out to develop a wearable device that switched between night vision and clear glass depending upon whether a rescuer was looking into dark or light spaces. The inventor achieved his goal by mounting an infrared camera with infrared transmitters onto the Moverio BT-100 platform. As Eric demonstrated the night vision application, Annika O’Brien recognized a potential solution to a problem that she had been thinking about for a while. She told the group about a friend who suffered from Face Blindness, a condition that inhibits sufferers from being able to recognize other people’s faces. Annika asked if a combination camera+Moverio+facial recognition software might be able to help those with Face Blindness identify people as they approached. I sat there admiring these fascinating people who represented a new breed of inventor: The Makerati. Rather than toiling individually in dank garages and basements, the Makerati work collaboratively through websites, chat rooms, coffee shops and hackerspaces. Driven by interest, desire, and caring, they willingly invest their own time, money, and deprive themselves of sleep in order to make a difference in the world. I’m looking forward to spending a little more time with them.